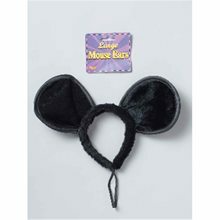 Mickey Mouse Ears.Includes: Black Mickey Mouse ears attached to headband.Size: Fits kids and adults.Material: Velvet.These Mickey Mouse ears are made of fine velvet and attached to a sturdy headband.Item is officially licensed by Disney. 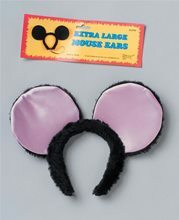 Extra Large Mouse Ears.Includes: One pair of jumbo pink and black mouse ears.Available Size: One Size Fits Most Adults.The perfect addition to any mouse costume! 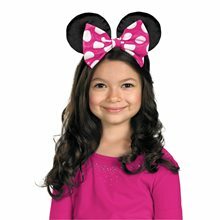 You'll look adorable in these plush jumbo pink and black mouse ears! Large Mouse Ears.Includes: One pair of Large Mouse Ears. Available Size: One Size Fits Most Adults and Teens. *Costume Not Included. Accessories Sold Separately. 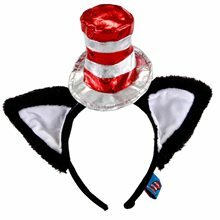 Get trapped in a deadly game of cat and mouse in these Cat/Mouse Ears. Your inspiration is Mighty Mouse in this black Fake Fur costume accessory. Recommended for ages 14 years and up. 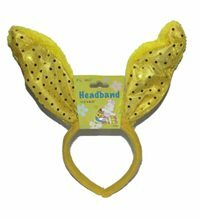 Costume Includes:Headband with ears and reversible bow. 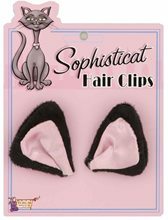 Sophisticats Cat Ear Hair Clips.Includes: One Pair of Cat Ear Hair Clips.Available Size: One Size Fits Most Adults, Teens and Children. *Costume and Accessories Not Included. Sold Separately. Handy and simple. Our Cat Ear Sophisticats Hair Clips feature black faux fur exterior and shiny pink interior. Wear them all the time!! Stitch kitty ear headband O/S BLACK,: Stitched Kitty Leg Avenue Headband Stitch kitty ear headband.